Quanto le strategie manutentive incidono sull’efficienza totale della fabbrica, come incrementarla e come ridurre i costi dovuti ai fermi macchina. Se si potesse approntare un modello statistico basato sul Machine Learning per studiare le eventuali anomalie ed infine utilizzare quel modello con i dati sensoristici in tempo reale per predire l’anomalia stessa? Il webinar vi darà un quadro delle attuali strategie e di come poter anticipare le anomalie usando il Machine Learning, in più sarà portato un caso reale e come TIBCO Software ha aiutato un produttore a risparmiare il 10% sui costi di manutenzione. David Rosen Digital Innovation Leader TIBCO Software Inc.
Digital leaders are now emerging in Retail. After a decade of fall-out from the relentless pressures of Amazon, outdated physical store models, and rapidly changing consumer preferences, an elite tier of survivors is demonstrating how to thrive. Watch this on-demand webinar exploring the trends in retail digital transformation and the keys to successful leadership. Miguel Torres - Principal Architect, TIBCO Software Inc.
Bitcoin is a hot topic these days, but the technology underneath this digital crypto-currency can potentially be used to build solutions for industries faced with supply chain inefficiencies. Other than simply recording transactions on a ledger, what other aspects of this industry could be impacted by blockchain? Can smart contracts be used to achieve more automated and streamlined interactions in a secure context? And where do concepts such as IoT and AI/ML fit? Join this panel discussion to hear about blockchain technology, solution offerings, and related concepts such as smart contracts. We will look at how blockchain can streamline supply chain interactions and improve the visibility and trust of these transactions across a network of participants. The session will discuss what we, as technologists, must consider as part of a blockchain deployment, and how this technology may impact your purchasing experience in the future. Over the past decade, there has been a major transformation in the manufacturing industry. Data has enabled a paradigm shift, with real-time IoT sensor data and machine learning algorithms delivering new insights for process and product optimization. Smart Manufacturing, also known as Industry 4.0, has laid the groundwork for the next industrial revolution. Using a smart factory system, all relevant data is aggregated, analyzed, and acted upon. Watch this webinar to understand use cases and their underlying technology that helped our customers become smart manufacturers. Buy or build? This question has tormented IT and development teams since the beginning of commercial software. When it comes to embedding analytics into your application, there is a lot to consider. Does the convenience and quality of third-party commercial software outweigh the cost-savings and fine-tuned control of building embedded analytics on your own? In this webinar, we’ll lay out the pros and cons of both options and explain the trade offs of embedding third-party analytics software into your application versus building and embedding your own analytics. Machine Learning (ML) is a field of growing importance for developers because they are increasingly expected to deploy ML models in production. Generally, ML has been the domain of data scientists and machine learning engineers -- and we want to change that! 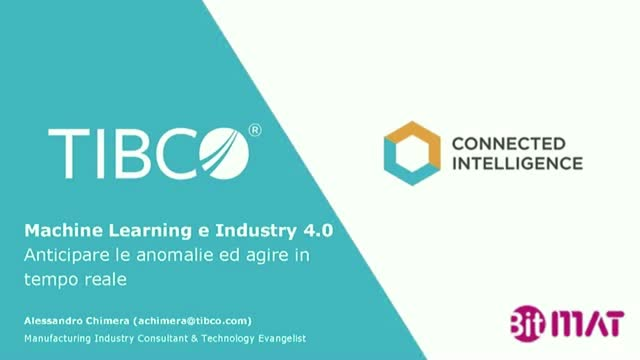 Join Bram Van Der Geest, Machine Learning Engineer at TIBCO, for a broad overview of ML with content aimed at developers. To illustrate all these talking points we’ll use nothing but Open Source software like Google’s TensorFlow and TIBCO's Project Flogo. Everything was easier when we knew where our code would run. Now, with the advent of microservices, functions as a service, and other massively distributed architectures, the traditional role of API Management—scalability, security, support—is changing. Join us for a 20-minute live webinar where TIBCO's Rob Zazueta will explain what these changes look like and how to adapt to them. You want to continue supporting your current architectures, while you begin adopting the brave, new world of massive distribution. APIs and microservices power today’s digital stack. You want to be able to tap into these APIs to quickly build and deploy new applications to better engage with customers or improve operational excellence. But, if you’re not a developer, how can you take advantage of all these new technologies to help your company accelerate the journey to digital business? Recent innovations in data discovery are dominating business analytics discussions in the CIO office. Meanwhile, large scale reporting systems continue to deliver the lion’s share of information; Most of the content consumed by organizations is still in the form of a report or a spreadsheet. Reporting keeps evolving and needs are shifting because relational databases are being augmented or replaced with integration platforms or NoSQL systems; monthly schedules with instant alerts; and static outputs with multiple interactive formats. In this session, learn about these market and technology shifts, the pressures they create, and the tooling that effectively answers important information delivery needs. Join this exclusive panel session live from Big Data LDN to find out about the crucial role data plays in the highly competitive world of Formula One™. Executives from Mercedes AMG Petronas Motorsport, Pure Storage and TIBCO will discuss how its collection, storage and analysis can make the difference between victory and defeat. In this panel session you’ll find out about the crucial role data plays in the highly competitive world of Formula One™ and how its collection, storage and analysis can make the difference between victory and defeat. Maintenance affects the total efficiency of the factory. What maintenance strategies increase it and reduce the downtime costs? Using machine learning, you can prepare a model of your factory, identify normal and abnormal states, then watch real-time sensor data to predict degradation and intervene to avoid inefficiency and downtime.